Follow me on my new Twitter! Or go to FinishYourCheck.com, for a great discussion among USHL fans, where you can find me very often. Thanks for supporting the blog and helping me realize my dream of being a scout, and I hope you follow me on Twitter and read my work on HockeyProspect.com! It's been a fun journey since I started blogging in February, but it must come to an end. 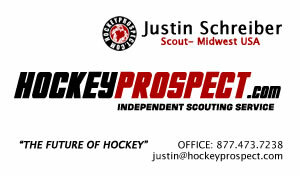 I'm realizing my dream by being added to the HockeyProspect.com scouting staff. I won't be writing as much, as I'll be scouting most of the time and will be very busy during the season. However, my opinions will be on HockeyProspect.com a lot, so you can continue to read my work over there. I'll be traveling around quite a bit during the season as well. I will post my new contact information below, to see it, click "READ MORE>>>. I am very happy to be starting my scouting career. Anthony Day (Sioux Falls) will be returning to the Sioux Falls Stampede for his second season in the USHL. Day was recently featured on the official USHL website, highlighting Day's and teammate Sam Coatta's offseason workout schedule. In that article, Day stated that he starting boxing this offseason, and that very well could mean that Day will bring a more a physical side of his game this season. Only time will tell if the Stampede's leading returning scorer will follow up on his great rookie season in the USHL. Day was one of the best rookies offensively speaking in the USHL last season. He showed off his ability to score fairly often, and he should get a bigger chance at playing time as a veteran. Last season, Day logged quite a few minutes on the Sioux Falls powerplay, picking up 13 of his 31 points while the Stampede were on a man advantage. Overall, Day scored eleven goals and picked up twenty assists on the year. Day is very talented offensively with a great shot and some of the cleanest passes in the USHL. But as a touched on earlier, Day has started boxing as a part of his offseason program, and although he was quoted as saying "It's not like I am trying to become a big fighter in the League...", I can imagine that Day coming back as a USHL veteran, will bring a more physical aspect to his game and that will make him a more complete fighter, whether he will drop the gloves or not. Day isn't committed to a college yet, but he has been talking to some schools, and he wants to play out East. After college, what Day's hockey future will be is anyone's guess. As with most players, his future depends on how he plays in college hockey. Please leave comments, I would love to hear them! The USHL has announced the schedule for the 2010 USHL Fall Classic which will take place September 22-25. I know I'm a little late to this news, but it broke while I was on vacation. Anyway, click here for the schedule. Here is the official post by the USHL. 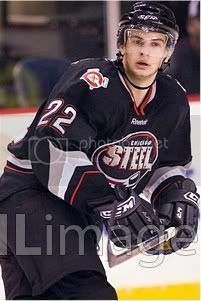 Dan Kolomatis (Chicago) is a 1991 birth date, coming back to Chicago for his third year in the USHL. Kolomatis was the Steel's best offensive defenseman last season, and he could repeat that role if he gets time on Chicago's powerplay. 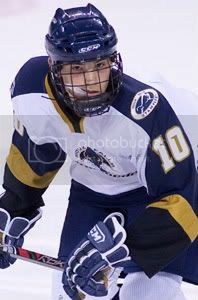 Kolomatis, a 6'0", 170 pound defenseman out of Basking Ridge, New Jersey, hasn't committed to a college yet, but if he plays well again, you can expect Kolomatis to consider plenty of options, as a defenseman who can play good offense are always in high demand in college hockey. Kolomatis' brother, David, has had a very successful hockey career, playing in the OHL with the Owen Sound Attack, and then getting drafted in 2009 by the Los Angeles Kings. Only time will tell if Kolomatis can follow his brother's path to the NHL. Kolomatis has the rare combination of defensive and offensive skills that you don't find in the USHL too often. Kolomatis missed only five games last season, and he made use of the 55 games he did play. Kolomatis racked up seventeen points last season with eight of them being goals and nine being assists. Kolomatis also racked up quite a bit of time on the powerplay, with eight of his points coming while the Steel were a man up. Kolomatis also mixes in some solid defensive abilities which adds to his overall value. Kolomatis, from what I've seen, likes to go more to block the pass on the ice or intercept the pass than to go for the check. While he's not much of a fighter, Kolomatis has shown that he will drop the gloves and defend his teammates. Fighting doesn't factor into player's futures very much, but it can help if teams know that player's will step up and defend themselves or their teammates. Overall, Kolomatis has a nice blend of offensive and defensive talents which should make him a sought after player for colleges around the nation throughout the season. Kolomatis should be heading to college hockey after the season, and he deserves the opportunity. Only time will tell if his career takes him above the college ranks.